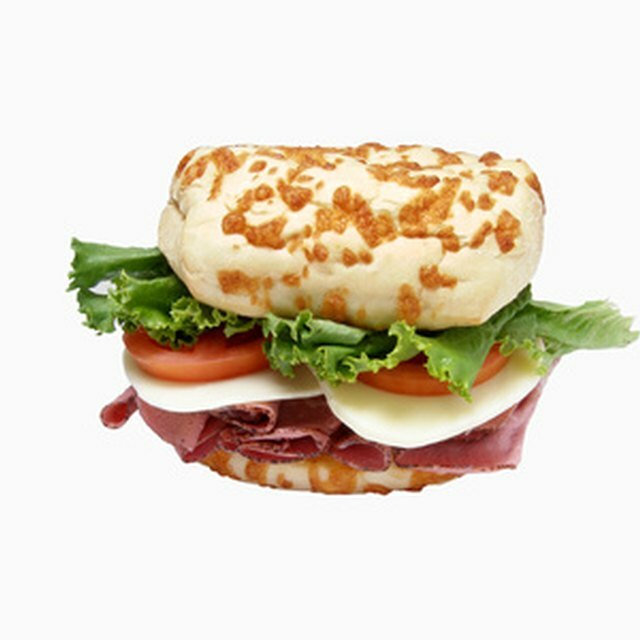 Swiss cheese and American cheese are good sources of fat and protein. Both Swiss and American cheeses are made from cow's milk. 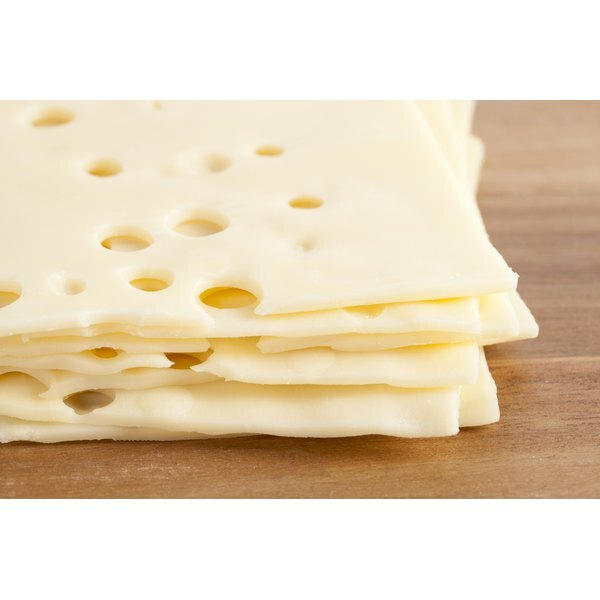 Swiss cheese can refer to any number of cheeses originating in Switzerland and is characterized by large holes that result from carbon dioxide released from the product during aging. American cheese is a highly processed product that has more preservatives and artificial colors than Swiss cheese, and is generally less nutritious. Both cheeses are a rich source of fat, protein and minerals. Swiss cheese has greater energy value, with 380 calories per 3.5 oz. serving vs. the 239 calories in a similar serving of American cheese. A calorie is simply a measure of heat, but is an accurate way to estimate the amount of energy a particular food provides to the body. Most adults need at least 2,000 calories a day, and a 3.5 oz. serving of Swiss and American cheese provides about 19 and 12 percent a typical adult's minimum daily caloric requirement, respectively. Most of the weight in Swiss cheese comes from fat. Each 3.5 oz. serving of Swiss cheese contains 27.8 g of fat, while a 3.5 oz. serving of American cheese contains 14 g. Both cheeses are high in fat, as a typical 2,000-calorie diet calls for about 44 to 78 g of this macronutrient daily. While the body needs fat in moderate amounts for energy, vitamin storage and organ protection, exceedingly high fat intake can influence weight gain and atherosclerosis. Each 3.5 oz. serving of Swiss cheese contains 26.93 g of protein, while a 3.5 oz. serving of American cheese contains 16.7 g of this macronutrient. Protein is a key component of the structure of the body's cells and helps build and repair cellular tissue. A 2,000-calorie diet calls for about 50 to 175 g of protein each day. A 3.5 oz.serving of American cheese contains 11.6 g of carbohydrates, while a 3.5 oz. serving of Swiss cheese contains 5.38 g of this macronutrient. Most adults need about 225 to 325 g of total carbs each day. The body converts carbs into glucose, or blood sugar, and uses it to fuel its energy needs. Both Swiss and American cheeses are high in calcium, with about 79 and 56 percent of the daily value for most adults for this mineral, respectively. Both Swiss and American cheeses are also high in phosphorus, although American cheese contains slightly more. Swiss and American cheeses are high in zinc and selenium as well, although Swiss cheese contains more of each. Minerals play a vital role in all the processes that control energy metabolism, central nervous system function and immune system health. American cheese contains 1,345 mg of sodium per 3.5 oz. serving. Adults should limit sodium intake to 1,500 mg daily to avoid high blood pressure, according to the American Heart Association. A similar serving of Swiss cheese contains 192 mg of sodium. Both Swiss and American cheeses are high in B-vitamins and vitamin A, although Swiss cheese generally contains about twice the vitamin B content as American cheese. B-vitamins help regulate the cellular processes that convert nutrients into energy and help build red blood cells, while vitamin A is important for healthy eyes, skin and teeth. How Many Calories are in Egg Whites With Cheese?